While this massive data has the potential to transform revenues and operational effectiveness, few organizations have been able to operationalize and monetize this promise. Creating a culture that can successfully leverage big data and analytics is about tying together the right technology, operating model, and people that make analytics a differentiator in the marketplace. Global markets and increasingly demanding customers are accelerating the pace of business. As a result, forward-looking organizations are beginning to realize that analyzing data is not sufficient; they must also take action on it. Whether in marketing, HR, or operations, more businesses must systematically operationalize their analytics as part of daily business processes. Operationalizing analytics is about integrating actionable insights into systems and business processes used to make decisions. As data becomes cheaper to gather and volumes increase, companies realize that making analytics programmatic by automating operational decisions can be beneficial to both the top and bottom line. Also, making data consumable to a wider audience than those who analyze data or develop models can dramatically increase its value to the organization and to customers. There certainly are challenges. Lack of trust in the data and results as well as obtaining the right skill set to collect, interpret, and properly communicate the data are constant worries. It certainly is a step-by-step process. But for organizations that make the commitment to overcome these challenges, that operationalize analytics in the day-to-day such that it becomes culture, the results are rewarding. Leaders in embedding analytics have developed the structural, technological, and cultural capabilities needed to succeed in their analytic efforts. While laggards remain focused on applying data for reporting past performance, leaders look ahead with analytics to evaluate risks and tradeoffs, understand cost and revenue drivers, and predict demand trends and customer requirements to help drive performance and innovation. Executives demand a forward view of business; analytics provides the vehicle for a more comprehensive and informed view of what could impact their business. With a greater level of integration of analytics into everyday operations, a more comprehensive forward view can be fashioned. Until recently, the term embedded analytics referred to analytics that were built into an enterprise application, such as CRM or an ERP system. Outputs might have included reports or visualizations embedded in the application itself. But the terminology and technology are changing to include visual analytics as a seamless part of the user interface as well as actionable analytics in interactive dashboards, automated analytics, and analytics that operate in real time to change behavior. These analytics are becoming part of a business or operational processes in order to bring results closer to decision makers and decision actions. Although more companies are starting to embed and operationalize analytics, they still face many challenges, many of which are related to people and processes rather than technology. Lack of trust in the data: People fear what they don’t understand. If the people being affected are not included in the process, creating an analytics culture will likely not succeed. People are concerned about losing jobs or power or lack confidence in the data used that go into the analytics engine. Lack of skilled personnel: According to an MIT Management Review, 40 percent of companies are struggling to find and retain data analytics talent. But, beyond those crunching the numbers, organizations must be rewired to trust data over intuition and historical methodologies, particularly when they are in conflict. This mindset change in mindset can face significant resistance. Lack of executive support or budget: Despite trends and proven success, some executives still do not understand what it takes to leverage data for decision making. Without their buy-in, an organization will often let data and analytics remain siloed in functional areas which can kill any hope of creating an embedded analytics culture. So how can these challenges be overcome? Start small. Slow and steady often wins the race. Small projects that prove successful within the business are often the best catalysts to gaining support on a grand scale. Resolving small issues consistently garners trust and opens the door to greater confidence in analytics. A proof of concept approach can provide significant value and gauge the appetite and preparedness of the organization to change. Education. Skills must be augmented not only within the analytics team, but in the general culture, to truly embed analytics in decision making. Often, outside consulting support can support a proof of concept to lend an objective perspective and fight through politics and internal barriers. Communication. Training is key, but transparency and open dialogue cannot be overlooked. Concepts of data analytics must be socialized and championed, particularly if executives are not yet on board. To drive a culture change, the business must be actively engaged, and benefits must be highlighted to key stakeholders and throughout the organization. In summary, let’s look at some best practices to operationalizing and embedding analytics to ensure success in creating an analytics culture. 1. Start with Business Objectives in Mind. 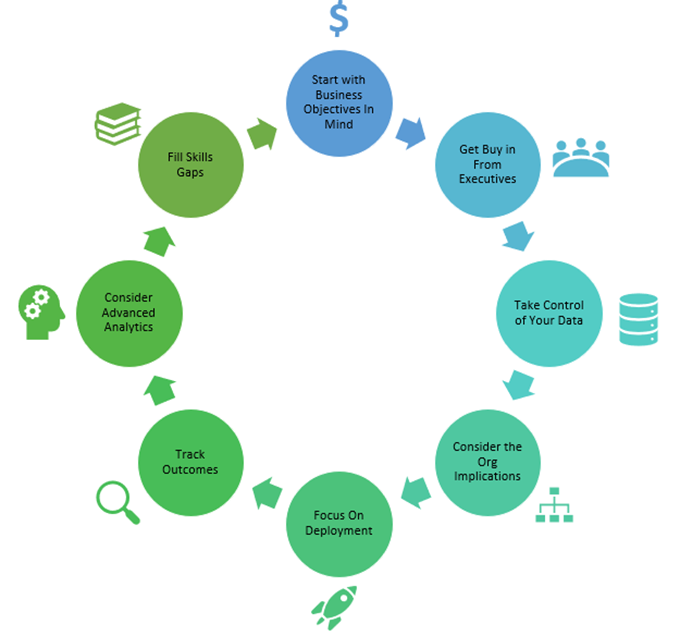 Whatever the analytics are to be installed, it is important to connect the outputs to a key business objective (Revenue, operating margin, ROI, etc.). Demonstrating a business impact increases the likelihood of success. 2. Get buy-in from executives. It can take time and effort, but if the leaders are not on board, organizational change likely will not happen. Outside support can often bring huge results. 3. Take control of your data. 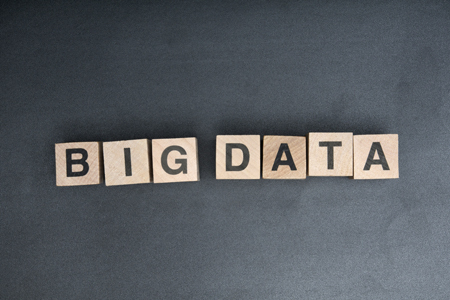 Data governance and stewardship are key to operationalizing analytics. A governance plan should be set in place that keeps current project and larger objectives in mind. Data quality goes a long way to building trust in the data. 4. Consider the organizational implications. Cultural issues can be the hardest to overcome as job security and fear of change come into play. Executive sponsorship, communication, and proof of concept can illustrate the value of technology and get everyone on board. 5. Don’t forget about deployment. Analytics only matter if they are used to take action. 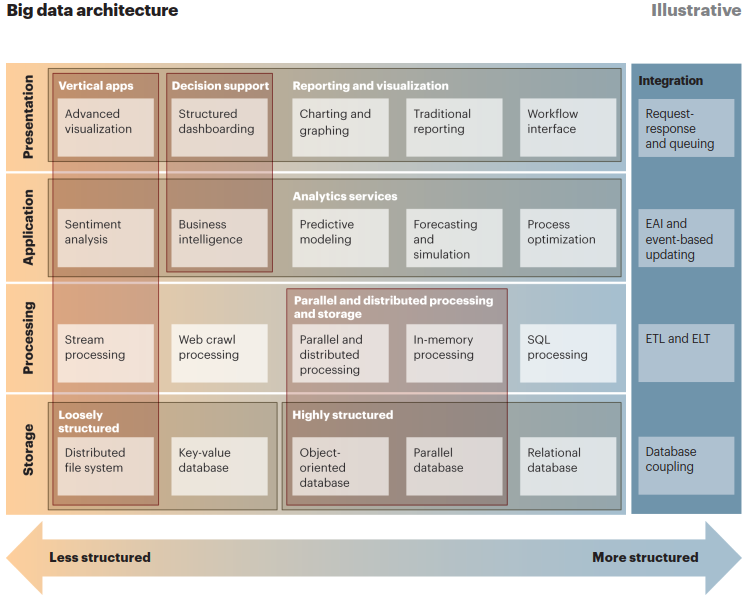 The organization must organize and execute around analytics which comes from proper deployment planning. 6. Track outcomes. Without proper results documentation, there may be debate about wrong decisions and the organization can easily fall back to doing things the way they were always done. Transparency accelerates adoption. 7. Consider advanced analytics. As companies become more advanced with new kinds of data and analytics, they are more likely to consider other data technologies. Companies that are ahead of the curve move past structured data on dashboards and move to other forms of unstructured data and higher analytics (predictive, prescriptive, artificial intelligence). 8. Fill skills gaps. Find the right mix of outsourced support and internal skill development to maximize the potential of your data. The journey is long. Transformation takes time. But those that move ahead will achieve the most significant results and have a real, sustainable edge over their competitors. Progress requires that companies accept that data and decision making can no longer remain siloed but permeate the organization and all decision making to uncover a long-term advantage.